Can I have more than one Bluetooth (BT) device paired with the Razer Leviathan at the same time? The Razer Leviathan can only be connected to one BT device at a time, it stores profiles of up to 4 devices and reconnects automatically to the last playback device. You can however have it connected via aux and/or optical cable and toggle between different inputs. Example: you can have your console connected via an optical cable, have your desktop connected via aux and pair the sound bar with your mobile device via BT, this allows you to switch between multiple connected audio sources easily. I can’t seem to connect to the Razer Leviathan via NFC, what am I doing wrong? Different mobile devices have different NFC receiver locations. Check with your device manufacturer on the location of your NFC chip and have the function enabled before attempting to connect via NFC. Apple devices such as the iPhone and iPads NFC are only made to work with Apple Pay and currently do not sync with other NFC devices. Does the Razer Leviathan have internal batteries for portable music playing? No. 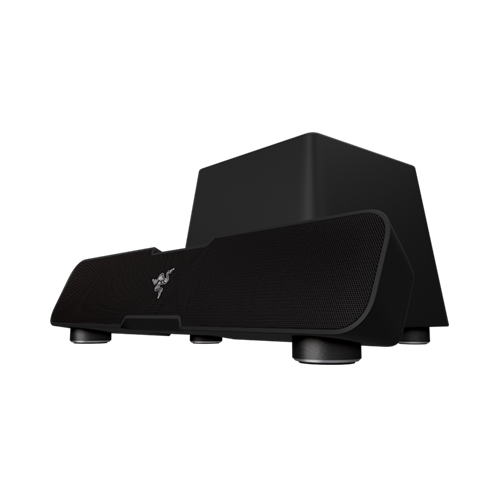 The Razer Leviathan is by default a 2.1 channel sound bar that is connected to a subwoofer and powered by an AC adaptor. Due to minimal wiring you can easily reposition the Leviathan to suit your audio needs. I don’t see an option on how to control the sound bar’s bass level, is that possible with the Razer Leviathan? Yes it is. You can increase or decrease the bass level of the Leviathan by pressing and holding the Dolby button and pressing either “+” or “-“volume buttons to increase or decrease the bass level of the subwoofer. How do I reset the bass level back to its original factory default setting? To reset the bass level you will need to factory reset the entire sound bar. First ensure that your sound bar is powered. Press and hold the mute button for 10 seconds and the sound bar will automatically restart itself – reverting back to its original factory settings. Should I enable Dolby when playing music? You can enable Dolby when playing music with the Razer Leviathan but it is not recommended. Enabling Dolby will have the sound bar process musical audio into virtual surround and that will affect the quality of your audio playback. Music is better enjoyed in stereo so we advise you to disable Dolby when doing so. Can I connect my Razer Leviathan to my PlayStation 4 via Bluetooth? At this time, Sony does not support any third party Bluetooth devices on their PlayStation 4 system. They may add this option in the future, but for now we recommend connecting your Razer Leviathan to your console with the included optical audio cable for the best playback experience. What is the “Service” USB port located behind the Razer Leviathan used for? The “Service” port is only used for technical work such as firmware flashing of the Razer Leviathan. Plugging a USB media device into that port will not work.